(Here is the first part of a piece I wrote for Biblical Seminary’s Blog. You can click over to read the post in its entirety). Everybody loves Martin Luther King Jr., or at least they love the idea they have of him. There is nothing provocative about naming him as one of your favorite American heroes, quoting lines from his famous “I Have a Dream” speech, or referring to him in one way or another to suggest how we can become that “beloved community” he often spoke about. In fact, our usage of Martin Luther King Jr., more times than not, would be in direct conflict with Dr. King himself, and the actual life and commitments he held to. “Our” Dr. King that we celebrate each year has been completely co-opted by the right and the left to further the shallow partisan ideological work in American society. Dr. King’s legacy has been thoroughly domesticated, like a house cat after being de-clawed and neutered. He is now safe. Safe to mold into our projections of who we want him to be. Dr. King is no longer a radical prophetic voice of a Christian preacher crying out in the wilderness. Instead, after he died, we built him a monument to adore, after our liking, and gave it a seat at the emperor’s table. However, the prophet never sits and fellowships at the table with an imperial ruler. The prophet is not accepted by the social order it speaks life into because he is always seen as a threat. Read the rest at Biblical Seminary’s site. I had the pleasure of reading Bonhoeffer The Assassin? : Challenging the Myth, Recovering His Call to Peacemaking, by Mark Nation, Anthony Siegrist, and Daniel Umbel. In this work, the authors have one primary and focused goal, that is to challenge the language used and assumptions held by many surrounding Dietrich Bonhoeffer’s legacy, specifically as it relates to his participation in the Abwehr and the resistance plots to kill Hitler. These assumptions we have about Bonhoeffer provide hermeneutical lenses through which we read his later work, particularly Ethics. 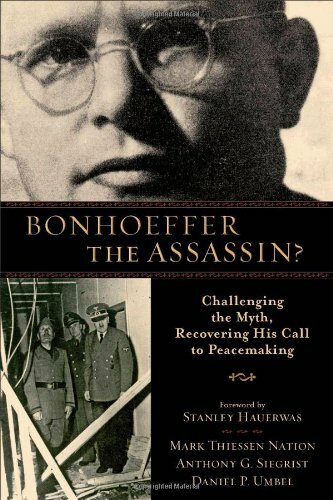 This book does not argue that Bonhoeffer wasn’t in the Abwehr, nor does it suggest that he did not know about the assassination plots or was distant from those engaged in those realities and plots. However, while recognizing and affirming those historical facts, the authors challenge what this actually means in terms of the nature of Bonhoeffer’s actual involvement and his ongoing theological positions. One of the strongest historical arguments that challenge our assumptions about Bonheoffer’s legacy in the book is how the book explores Helmuth James Count von Moltke’s own legacy and participation in the Abwehr, in his own words. Considering Moltke’s actual participation, and all that it involved has considerable import for expanding current imagination around role participation possibilities. On paper, “His job description said that he was to gather military intelligence for the Wehrmacht, the Armed Forces, using his expertise to assist Germany in its war efforts. This entailed reading reports regarding German military efforts as well as those of other nations; it also involved extensive travel.” (3) However, Moltke was involved in the resistance, and therefore that was only a cover. In reality, “Making allies where he could, he attempted to work against the escalation of the war as well as to mitigate atrocities masquerading as legitimate war tactics” and this “involved gathering specific data and communicating with relevant German officials, attempting to convince them of the need to obey international laws, sometimes utilizing arguments of self-interest—such as mutual, respectful treatment of political prisoners—in order to be convincing.” (3) Along with this, he “improved local conditions for people where he could through invoking legal principles. After he knew that Jews were being deported, he attempted to get them rerouted to countries that would be a safe haven for them. When possible, he personally helped Jews escape to safe territories.” (3) Finally, he also used connections in England to communicate that there were Germans that were opposed and actively resisting Hitler. (5) What becomes pretty clear, is that Moltke was an important figure in the resistance, had military background and expertise, saw his participation as a way to avoid conscription in the war, and sought to resist German through nonviolent means (and actually participated in the Kreisau Circle which mostly rejected violence as a viable option). The authors make a compelling case from here, to at least reconsider what Bonhoeffer’s actual activity and reasoning for joining the Abwehr might have been. However, leaning especially on Dramm’s work, he clarifies Bonhoeffer’s activity as being more of a cover so that he could avoid conscription and uphold his convictions rather than because he desired to participate in assassinating Hitler. Similarly, his actual everyday responsibilities and actions had nothing to do with assassination plots. However, it is from Bethge’s important biography of his friend, which leads most to interpret his participation as implying more active involvement in assassination plots. So, the challenge turns towards challenging Bethge’s depiction of Bonhoeffer at that time. Readers will have to wrestle with these points being brought up for themselves, because they are both compelling and yet controversial in their questioning of Bethge. The last few chapters engage Bonhoeffer’s theological work, exploring its continuity and discontinuity. It is less controversial, though no less important in its place in the book. The authors easily demonstrate the theological continuity of Discipleship with the positions being presented in Ethics as well as Bonhoeffer’s Prison Letters. Their careful theological work will either win over their reader, or at least will leave a reality that there is some tension between what Bonhoeffer wrote in his theological work and what he said informally to Bethge. This book, despite some responses from the Old Guard of Bonhoeffer studies, is not reaching that far beyond what is already known in Bonhoeffer scholarship. In fact, it relies heavily on the work of others to make its point. However, it does question Bethge (in a manner that I found actually very respectful and transparent in relation to its challenge). This book at the least will make a great reading conversation partner with Schlingensiepen’s biography which is certainly following the lead of Bethge in this regard. I would expect that most, regardless of whether one agrees with the approach of questioning Bethge’s account or not, will be challenged in this book in a manner that will change the way they describe Bonhoeffer’s role in the Abwehr, and his overall reasoning for being there to begin with. Finally, the book will help draw out much more continuity in Bonhoeffer’s theological work from Discipleship to his death. I gladly recommend this book as a stimulus for further consideration to those who already have some familiarity with Bonhoeffer’s life and thought.